Our Summer Base Campo Pop-Up has Closed! Our first pop-up was an amazing success! Thanks so much to everyone who came out to adventure with us this summer. Now, it's time for us to cook up our next big adventure - to stay up to date on where we go, sign up below! Sign up for our Insider (Outsider) program to join the Campo family. Outsiders get the best deals and early access to new adventures, events, and gear! We make sure to only send out the good stuff and will always protect your privacy. Thank you for becoming an Outsider! Welcome to the family. Keep your eye out for early access e-mails and special promos. See you outside! At Campo, you'll be given a (canvas) roof over your head, a lil' somethin' to sleep on, and some lights to lead the way... It doesn't take much to enjoy a billion stars. We'll hook you up with the best camping setup we know so you don't heave to sweat the small stuff. + $10 / Hygienic sleeping bag liners* + $2-$15 / Camp Snacks + $1.50 / Coffee + Tea + $1 / Water bottles * Everyone needs to use a sleeping bag liner - we have them for sale or rent on site. Few things are more enjoyable than sitting around and cooking over an open fire. Our Camp Kitchen is stocked with all the camp-style cookware you need to whip up something delicious. Pots, pans, stoves, grill, open fire, flatware, dishes, basic spices, oil... Just bring your favorite camp foods and you're good to go! Favorite camp foods Special Seasonings Water Bottles & Potable water If you want to bring any special grills or cooking equipment of your own, just let us know and we'll set you up! 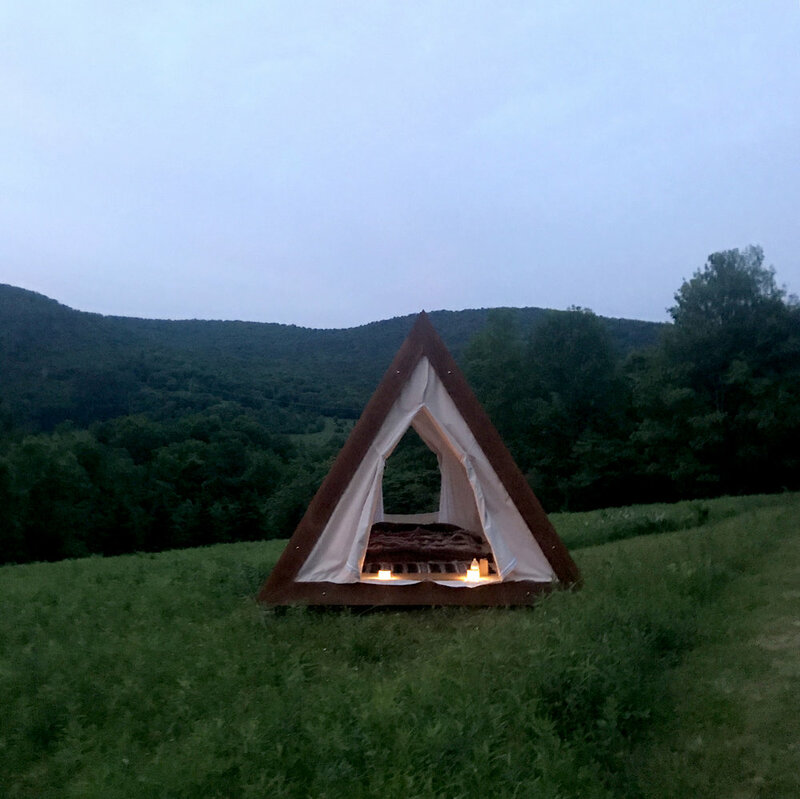 Camping is just where the fun begins - your site is located at the foot of a Catskill mountain with its own private trails. You can hike straight from your tent into the woods. We partner with local pros so you can sign up for adventures like kayaking, yoga-ing, fishing, and more. 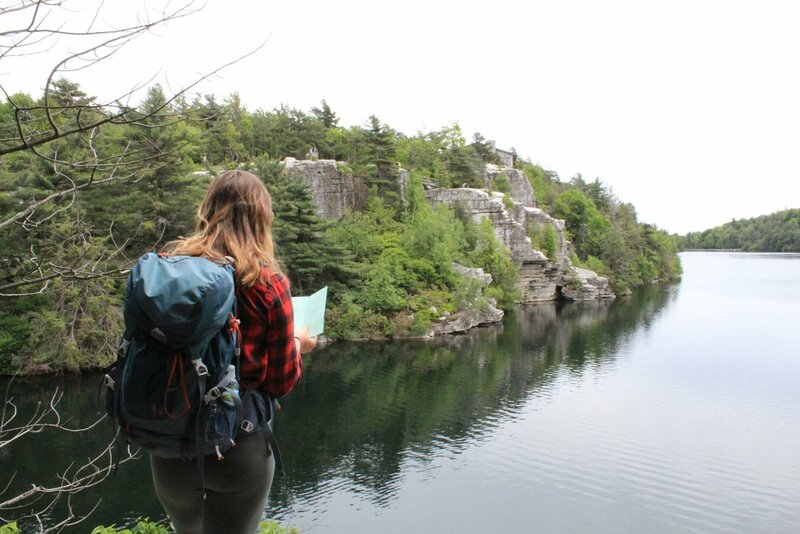 We provide all campers with our famous custom written guides that contain the most beautiful spots, challenging hikes, and local gems in the area. Personally tested and approved. Our Popup Campo site is home to our first set of Base Campos and is located on an amazing 100 acre farm-turned-retreat with trails, swimming ponds, and beautiful views. We are situated within 30 minutes of some of the best Catskill gems, such as the Pepacton Resevoir, Delaware River, Andes, Delhi, Bovina, Roscoe, and Livingston Manor. "Love, love my first experience on camping and Campo made it so easy, no hassle on bringing any gears or cooking utensils. Caro, my host was so nice/knowledgable, she provided many local guides for us. My friends are already inquiring about the Camp site and I'm looking forward to bring my other family members to join us next time." "Hands down the best experience I've had outside NYC in years. It's crazy that just a few hours drive away from the city is a narnia-like escape - surrounded my nature, fresh air and no cell service. I didn't realize how much I needed a 'manhattan-detox' until I arrived. Even though the weather was chilly and rainy for about 60% of my trip, I couldn't stop smiling. I was really nervous about how the camp would be set up / if I would be prepared enough, but it was so simple! I brought clothes and food for the weekend and that's pretty much all I needed. I cooked a bunch of steak the first night, and then was able to have it for the rest of my meals. Caroline had amazing snacks and drip coffee available so I would never go hungry! During the day, we did a little tour of the catskills and the small towns had so much character. One of my favorite parts was foraging for ramps and learning the art of foraging - so cool. I CANNOT wait to go back and explore more on site and the surrounding area!!" "Whether you're an experienced camper or just getting started this is an awesome and almost luxurious camping experience. Just about everything you'd need on a camping trip is provided by the people at Campo, from the tent to cookware to entertainment. They handle it all and make it look great. If you can't afford your own camping gear or simply lack the room to store your own gear, this is a great way to get a taste of the outdoors life." "I moved to New York from California and I really miss the outdoor culture and community. At Campo I found my people! Can't wait to come back. Thanks guys"
"CAMPO was amazing! Even though we had rainy weather the entire weekend, Caroline found enough indoor local activities to keep us entertained the entire time!! We had the best time and the campsite was an absolute beauty. The camping tools and cookware were beyond luxurious and we were able to make an amazing meal of steak and potatoes the 2nd night. Cannot wait to come back!" "Every detail was thoughtfully considered, and beautifully executed. Campo anticipated our every need, ensuring that we had a truly relaxing weekend that was stress free and serene." Part of the beauty of wilderness is the wild part, so we have a few extra special notes we ask all campers to keep in mind. For any other questions, check out our FAQ! Yep - watershed! So, campers have access to amazing mountain spring water, but we ask that you bring your own potable water or purchase bottled water from our communal area. We love midnight snacking, but so do our furry friends! For your safety and the safety of wild animals, we keep all food in our communal kitchen area.